Vegetarian burgers have never really done it for me, they’re either worthy or tasteless or both, but sometimes I want something to bite into, something firm and gooey, sweet and savoury, messy and filling. 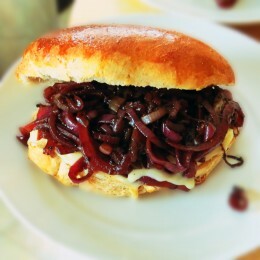 These caramelized onion and Brie or Camembert sandwiches really hit the spot for me. I’ll often make them at home for a lovely filling lunch, but they can also work well to take along to a summer cook-out, saving vegetarians from the horrible Hobson’s Choice of a salad sandwich or a burnt “protein patty”. Make a giant tub of onions beforehand, and you can wrap them in foil to warm on the barbecue, and you can cook the Camembert in its box on the grill, but it’s best to wrap that in foil to prevent a “flaming cheese emergency”. Be sure to take along extra, meat munchers love these sandwiches. Do choose a firm bun, regular floppy burger buns just won’t hold up to the level of deliciousness within. Some people avoid eating the rind of the Camembert, these people are known as “fools”. Scoff the lot, it’s delicious. If you like this one, you’ll likely enjoy a hot brie and grape sandwich too. As to whether you’ll call these onions Car-a-melized or Carmel-ized, it seems it all depends on which side of the Ohio River you were born on.